This module DOS 7 (Dolgovremennaya Orbitalnaya Stanziya) formed the core of the Mir space station complex. The core module, launched 2/19/86, has a mass of ~21 tons, a length of about 13.1 m, and a maximum diameter of 4.2 m. It consists primarily of a passage area with five docking ports, a working area housing the command station, living/eating and hygiene facilities, and a propulsion section through which a tunnel allows access to the Kvant module. Kvant 1, an astrophysics module that accomodates instruments from several countries, was launched 3/31/87 and docked to the core module in April 1987. It is about 5.8 m long, has a maximum diameter of 4.15 m, and a mass of about 11 tons. Kvant 2, housing scientific and technological experiment equipment, a shower facility, and an airlock supporting extravehicular activities (EVA) by the crew, docked to the station in December 1989. It has a mass of 19.5 tons, a length of 11.9 m, and a maximum diameter of 4.35 m.
The Kristall module joined the station in June 1990. It is mainly dedicated to technological research, such as semiconductor and biological experiments. It also houses Earth-observation instruments. Its mass and dimensions are similar to those of Kvant-2. In August 1992, a thruster package, known as "Sofora", was installed on a 14 m mast mounted on top of the Kvant module. These thrusters allow efficient and propellant-saving attitude control of the station. Spektr, a 23.5 ton Russian module, joined Mir in May 1995. It carries a Belgian grating spectrometer MIRAS that will monitor atmospheric gases such as ozone, carbon dioxide, freon and sulfur. It also carried some American equipment to implement the Mir-Shuttle rendezvous scheduled for late 1995. 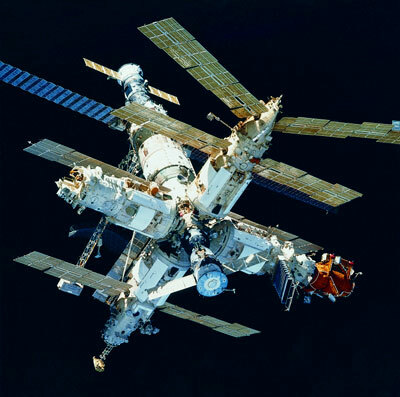 SO (Stikovchnoy Otsek) was a docking module, which allowed a greater clearance between the Mir station and the Shuttle to avoid moving the Kristall module to an axial position for each docking. It was delivered in November 1995. 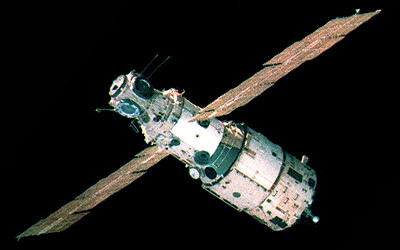 The Priroda module joined Mir in April 1996. It is mainly dedicated to Earth-observation tasks such as ocean surface-temperature measurement and studies of ocean/atmosphere interactions. It was the aim of the project to provide the full variety of existing remote sensing technology using instruments in almost all usable wavelength ranges as well as active and passive sounding methods. So the Priroda module carries optical and infrared scanners, an imaging spectrometer, a LIDAR, scanning and pointing microwave radiometers, synthetic aperture radar and high resolution digital (stereo) cameras. Logistical resupply of Mir is provided by the unmanned Progress, Progress-M and Progress-M1 transporters, with a payload capacity in the order of 2.5 tons. The crew is transported to and from the station with the Soyuz-TM and later Soyuz-TMA ferries, which can accomodate three astronauts/cosmonauts per trip. Both the Soyuz-TM and Progress are expendable systems and are launched by the Soyuz launch vehicle. Later the NASA STS (Shuttle) missions also docked with Mir, and have transported crew and materials back and forth. The results of the experiments, including samples, film, etc., are usually returned to earth by the astronaut/cosmonaut on board the Soyuz-TM or the Shuttle. A special unmannned re-entry capsule called VBK-Raduga enhances these return capacities. The whole Mir-complex was deorbited on 23.03.2003 over the pacific. The complete history of the Mir complex can be found here.